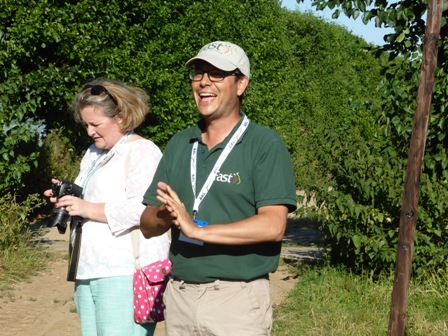 On Tuesday 19th July, The English Apple Man joined the Under 40's at Brogdale Farm. 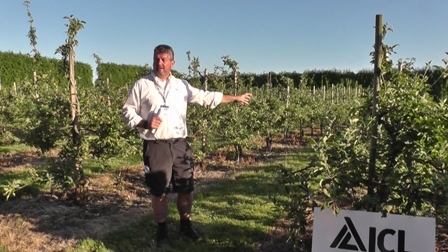 It's Tuesday evening on the hottest day of the year and The English Apple Man is in the company of his 'young U40 friends' for a very informative and socially enjoyable evening. 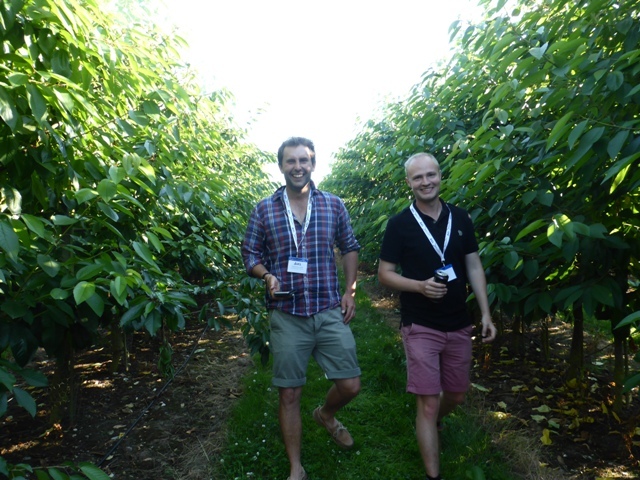 The event came about as Charlie Dunn - U40's Chairman and Scott Garnet - ICL discussed the trials work going on at Brogdale Farm under the management of FAST personnel. A perfect opportunity for U40's 'bonding' and an insight into the valuable research carried out by FAST on behalf of ICL. An extract from the ICL website summarises the scale of ICL operations. "We are one of the world's largest producers of potash and an integrated producer of a variety of products based on phosphate rock, including phosphate fertilizers, phosphoric acid and animal feed additives. We are the 6th largest potash producer in the world and the 2nd largest in Western Europe. We are also the largest producer of PK fertilizers (compound potash and phosphate fertilizers) in Europe. Our major markets include Europe, Brazil, India and China". FAST - Brogdale Farm - On arrival, we were offered a very welcome choice of cold drinks; the temperature at 5.30pm was still 30 degrees C.
Before visiting the ICL trials, we visited the Cherry systems trial, where FAST advisor Ivan Velasco updated the group on the 'plus and minus' virtues between Table, Espalier, Run through, UFO Angled Cordon, Vee System, Bibaum etc. 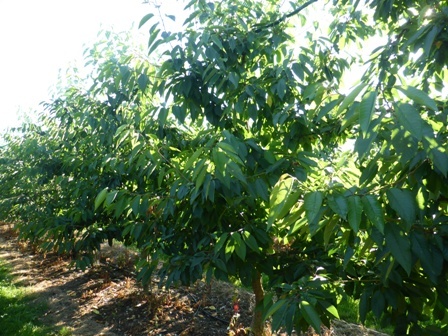 Ivan drew attention to the twin stem, where the tree was pruned to grow two upright leaders in a V formation; this is different to the true V format of the Bibaum which has two buds 'budded' onto the rootstock producing two leaders of equal vigour. Another system Ivan explained was the UFO - 'Upright Fruiting Offshoots' the format where the trees were planted at 45 degrees and four upright fruiting leaders created to carry the crop; Ivan said the objective was to control the 'apical dominance' and this system has resulted in the top of the tree growing slower. 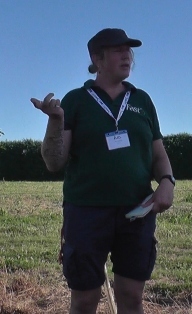 Next up; Abi Dalton - FAST Trials Officer: Abi explained three trials at Brogdale Farm; these are internal trials funded by The Brogdale Trust. We saw the 'Climate Change' site; the 'Misting Trial' and the 'Fruit Wall' trials. Abi explained the Climate Change Trial is being led by The University of Reading and they will have Phd students working on this project for the 5-10 year 'anticipated life of the project. 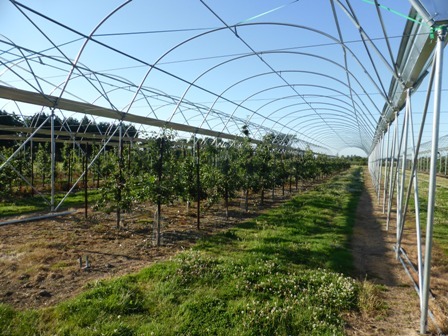 The purpose of the Climate Change trial, which involves erecting large tunnels over an established trial orchard, is to simulate different temperature profiles. 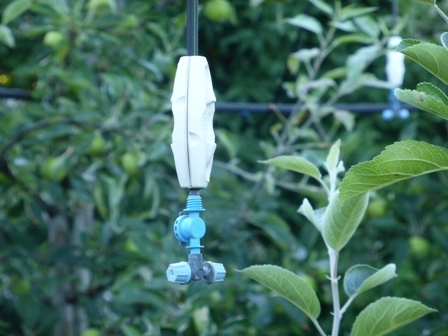 The project will be looking at how apples respond to temperature and water stress. There are three triple span tunnels with identical trees in each triple span block. The tunnels will be covered in September and that is when the trial will begin. The project was designed by the University of Reading. One block will be kept at Ambient temperature, a second at Ambient + 2 degrees C and the third at Ambient + 4 degrees C. The temperature regimes will be achieved by automatic venting. There are 21 varieties in each tunnel, fully replicated across the three blocks. 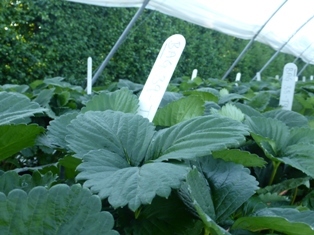 Assessment of bud stages, flowering and harvesting; there are early, mid and late season varieties in the trial blocks. Katie explained a combination of misting and tractor applied chemicals forms the trial regime. Fusion a non pesticide solution with a proven record of assisting resistance to mildew' primarily by raising the health of the leaf is applied twice a day every day. 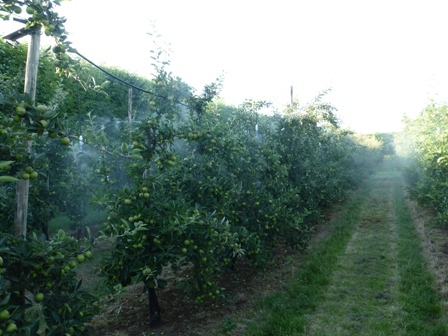 Gala and Braeburn are the varieties in the misting trial; some rows are sprayed conventionally and some rows in association with the misting/spray regime. Extensive assessments are taken for analysis of scab, mildew, nutrition etc. After harvest a 100 apple sample is taken and analysed to determine influence on size, quality etc. 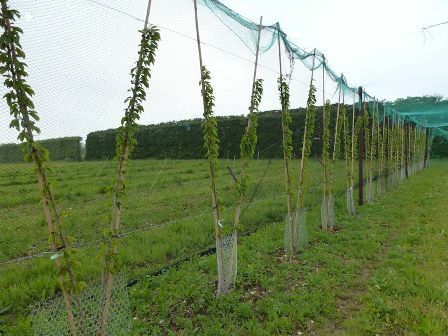 Abi said this is the fifth year of the trial; Cox is not very suitable; "but we have seen higher cumulative crops on Cox"
In row Cox spacing is 0.8m for the standard pruned trees and 0.6m spacing for the fruit wall. Gala and Braeburn are planted at 0.4m. 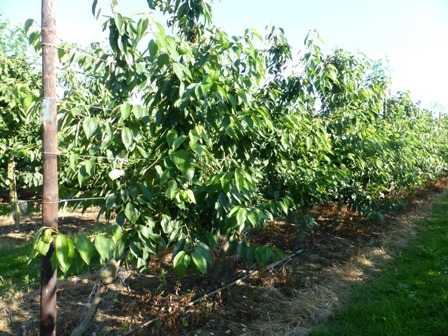 During the summer regular leaf counts are taken and when the 9 leaf stage is reached, the 'fruit wall' cut is made. Abi said the target width of the fruit wall is 20cm at top and 40cm at the bottom. She feels some inter pruning (inside the row) by hand is still necessary to keeping the trees in good order. 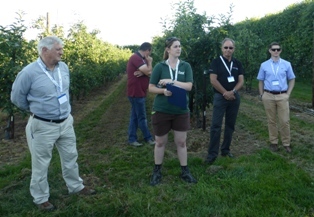 Following on from Abi Dalton's tour of FAST internal research projects, Scott Garnett, ICL's 'Speciality Agriculture Manager' for UK & Ireland reviewed three of the research projects at Brogdale Farm financed by ICL and carried out by FAST personnel. The first project we visited was the replicated trial with 9 replicates; the 9th being the 'control' with just a standard NPK nutrient feed. Scott said "we are testing 4 technologies for foliar application, also 4 products that we are putting into the root system, bacteria amino acids for root development and the establishment of the plants and to see the influence on the amount and quality of the fruit. The pesticide applications are the same on all the replicates. 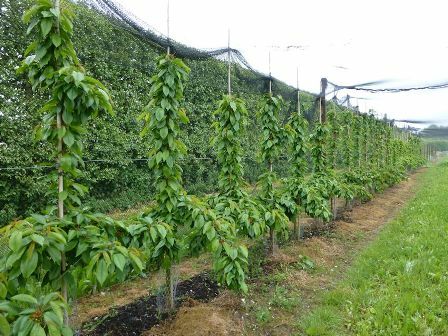 Once the fruit ripens the plants are picked every other day and each 'bag' is treated as an individual area and put into individual punnets before evaluation for weight, fruit firmness, brix (sugar) quality and a shelf life test. Next we moved onto apples and the second year of treatment where an ICL product is compared with leading products; the replicated trial will be continued for 'at least' another five years. Scott considers that you can only influence the uptake of Calcium 'into the apple' when the fruitlets are at the 7mm-10mm stage; e.g. when cell division is taking place. 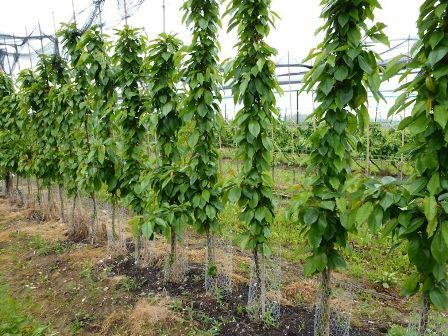 Scott said due to the low transpiration of the fruit, which he believes motivates the calcium uptake to travel directly from the root system - 'bypassing' the fruit straight to the leaves. 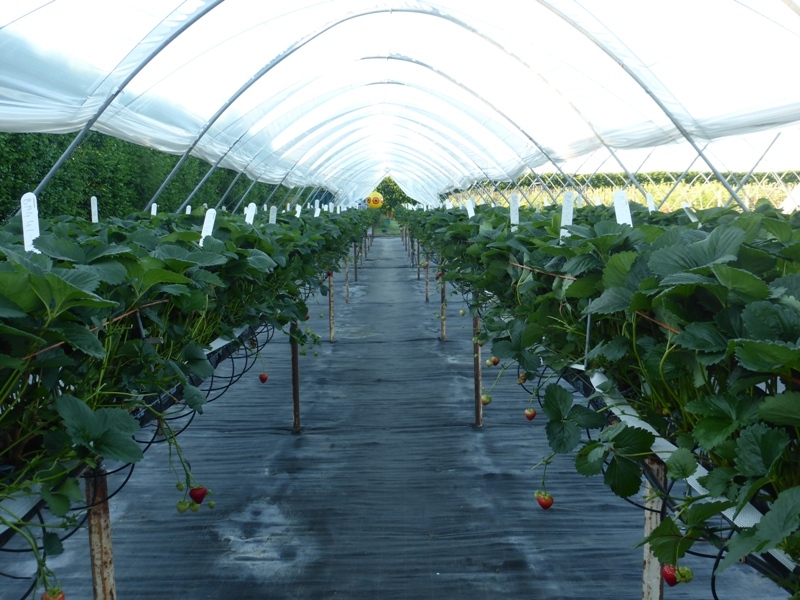 Although this could be interpreted that calcium 'targeted at the fruit' is wasted by applications across the season as a whole, Scott said; "we do not recommend that growers stop using calcium products through the season, we need a lot more research before we can advise this action". Scott said 'we are' doing a lot of tests; the fruitlets are tested three times for nutrient status; also yield tests and when picked the fruit is held in store and shelf life tests; including '7 day warming tests' to evaluate the benefits or not of the applied nutrient products. 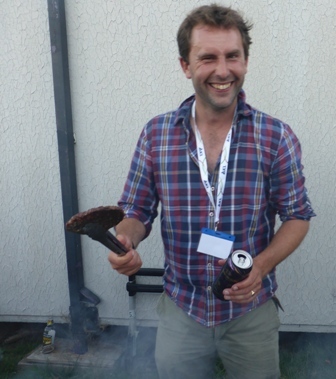 Rob Cook - FAST - has the responsibility for the collection of samples and evaluation of the Strawberry and Apple trials. An area has been added to the trials this year using a technology called glycine betaine; glycine betaine is a plant extract that is present at high levels in plants like sugar beet, seaweed and cactus, plants that have to cope with a lot of stress. Scott said; "We (ICL) have a form of glycine betaine that we are starting to use as an ICL formulation and 85% of our global trials with this product have produced positive results. In this trial the ICL glycine betaine has been mixed with Stoppit. Stoppit has been applied at 3 litres per hectare (on its own) while the B replicate has had Stoppit + ICL glycine betaine at 4kg per hectare and the A replicate Stoppit + 2kg per hectare of ICL glycine betaine. Scott said the first application was made when the fruitlets were at the 7mm-10mm stage and a second application will be made 3 weeks before harvest because we know glycine betaine will last for about a month and these two periods; 'cell division and at the stage when the apple is removed from the tree' are the two most stressful times for the tree. 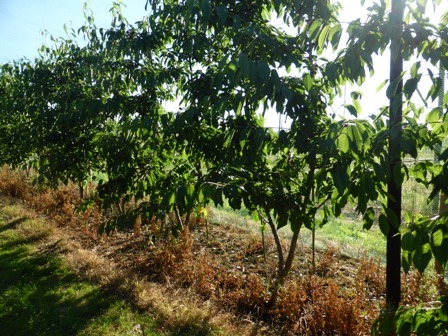 Scott summarised by saying "we will continue this trial next year, but we are hoping to see a response from the tree showing the plant goes into the winter a lot stronger"
Results to date show; where the glycine betaine went on at 4kg the calcium content in the fruitlets was 50% higher than where we applied only 2kg glycine betaine or in the control area. 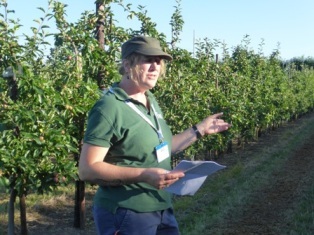 Scott said that at 8kg per hectare it would be far to expensive for a fruit grower and part of our future trial work will be evaluating whether by adding a surfactant or some other product we can deliver an economical product which delivers the same improved fruit calcium levels achieved in the trials. 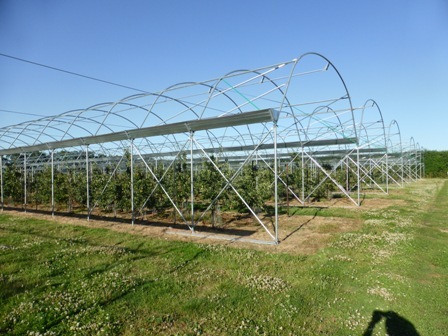 In addition to the trial plots at Brogdale Farm, ICL have similar trial sites at three commercial farms in Kent and 'mirror trial sites' in Spain and Germany. 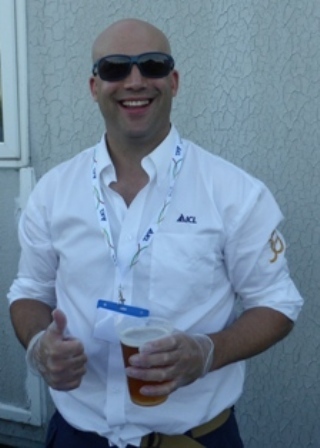 The English Apple Man Comments: "Yet another enjoyable occasion with Under 40' members; thanks to FAST personnel for their input and thanks also to ICL who are major sponsors of the 2017 U40's Conference in South Africa. 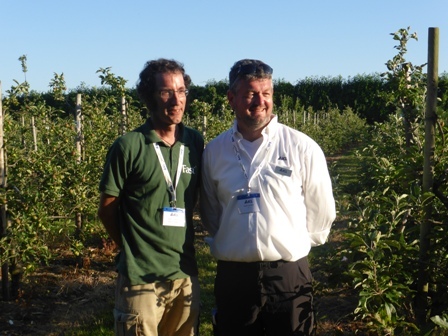 Next week The English Apple Man will report on Fruit Focus which was held this week - On Wednesday 20th July! I recently led a discussion about the future of food and food distribution with a group of 20-year-old's from all over the world. I was taken aback by their views and opinions, which collectively were dismissive of the role of supermarkets as a way to get food. To them, supermarkets are a form of "daycare for the elderly." They told me supermarkets are more important to older people, who they defined as being in their fifties and older. This younger generation believed older people visit supermarkets for socialization and interaction. They believe they spend their shopping time chatting to staff about the food and at the register for social purposes more than real information exchange. Should this be of concern to those who are in the supermarket business today? Is the long-term future of the supermarket open to question? How does this next generation expect consumers in the future to get food? My young audience told me that instead of shopping in grocery stores, they purchase food online and imagine a future where this will be their only way to get food. The emergence of online retailers, such as Ocado in the U.K., offers the opportunity to order home-delivered food online via telephone or computer and have it arrive in a very precise window of time. Young people will become used to purchasing food in this way. Why would they ever go back to bricks and mortar? These 20-year-old's are not alone in imagining a different future for the supermarket. The 2015 World's Fair in Milan presented a vision of "the supermarket of the future" as one with interactive screens that allow shoppers to choose from many options quickly. Another version is a "drive-through market," where everything is set up so that purchases from the car can be loaded almost instantaneously. Already, Tesco in Korea has perfected the "vending machine supermarket." Kroger has been testing new technology and services, such as QueVision and Express Lane, in order to keep up with customer expectations regarding the grocery shopping experience. A myriad of others, from Whole Foods to Microsoft, are getting in on the act. All of these fail in one key criterion. They imagine shoppers will continue to go to where the food is sold rather than have the food come to them. Over the last 50 years, this was the fundamental precept on which the supermarket business was founded, that supermarkets need to be as close as possible to the consumer while maintaining economies of scale. Food distribution supply chains were cost-saving and had convenience in mind. The next generation imagines a future in which everyone will have a personal shopping drone. Programmed through a smart device and capable of understanding what its programmer/consumer looks for when choosing fresh food, it will have the advantage of convenience. Size and mobility will allow goods to be delivered almost immediately. This may be combined with some form of SmartWare technology, which measures individual calorie and nutrient requirements, predicting and delivering precise nutrition in a timely manner. Taken a step further, shoppers could virtually visit supermarkets via headset, shopping in the comfort of their own home while still feeling as though they were making the decisions themselves, and even ask friends to virtually shop with them! This shopping can occur without humans being on-site. So what should "supermarketeers" take home from these 20-year-old's? Will supermarkets no longer be needed to sell food? Industry publications indicate that this is not a vision supermarkets share, moving control of how food is purchased from the entity that controls the bricks and mortar into one which controls the virtual or internet space. Some fundamental questions arise. Does this help new entrants or incumbents? Does it facilitate or stifle competition and innovation? What are the new rules of competition? In this new world, the launch of new products, spontaneous purchases by consumers and the availability of free samples will be determined by a virtual presence, more to do with programmers and coders than with the physical location of a building or supermarket. Do you see challenges with the new paradigm? How do we secure delivery to the home? No problem, deliver the goods by drone with secured access to an outside door, refrigerator or cupboard. What can be done to ensure that these small drones don't fall and kill people? Dedicate drone lanes, channels or space. Maybe these will be the very roads used today by cars to transport people. They can be transitioned to drone activity, especially since relatively affordable drones are capable of carrying up to half a ton and may soon be carrying people. A big win for young people is that purchasing food no longer has to occur through existing food retailers, and the control of food can move into the hands of growers or farmers. People can be even more connected to their food and potentially interact directly with farmers who produce and can grow to order. What are the implications or regulatory concerns for producers and manufacturers of food ? The collateral damage of these changes would be the demise of the existing food distribution chains, but in the mind of a 20-year-old this is an acceptable consequence. In their world, traditional distribution networks, food markets and convenience stores will end.